Vinegar herbicides should be sprayed with backpack or pump up sprayers - not with hose end sprayers. and gravel, around trees and other woody plants. Vinegar is a fantastic product and has become an important staple for organic gardening and living. It is also now easier to find in garden centers, hardware stores and farm stores. The personal health and food versions are available in drug stores and grocery stores. Vinegar comes in several strengths and formulations and all forms have important uses if the right vinegar is chosen for the specific use. Vinegar was discovered by accident about 10,000 years ago when wine was accidentally allowed to ferment too long and turned sour. It can be made from many products, including beer, apples, berries, beets, corn, fruits, grains, honey, malt, maple syrup, melons, molasses, potatoes, rice, sorghum and other foods containing sugar. Natural sugars in these food products are fermented into alcohol, which is then fermented into vinegar. Organic apple cider vinegar that’s used on food and taken internally. Fruit vinegar is made from the fermentation of a variety of fruits. Apples are most commonly used, but grapes, peaches and other fruits also work. The product label will identify the starting ingredients, such as “apple cider vinegar” or “wine vinegar”. Malt vinegar is made from the fermentation of barley malt or other cereal grains. Sugar vinegar is made from sugar, syrup or molasses. White, spirit or distilled vinegar is made by fermenting distilled alcohol. Distilled white vinegar is made from 190 proof alcohol that is fermented by adding sugar and living bacterial. Natural vinegar contains at least fifty trace minerals. Vinegar that is made from the petroleum derivative, 99% acetic acid, is not acceptable in an organic program. 10% white vinegar used to make my herbicide mix. 20% vinegar product that is labeled for organic weed control. The strongest vinegar available in retail stores is 30%, but it is far too strong and should never be used. 20% or 200 grain is also available, but I consider it stronger than necessary in most cases. Some of the strong products are actually petroleum- based as mentioned. 20% strength vinegar is corrosive enough to eat metal and very harsh on the skin and eyes and dangerous to breathe. Fermented 20% is sometimes used for making commercial sweet pickles where stronger acids are needed to override the sugar. 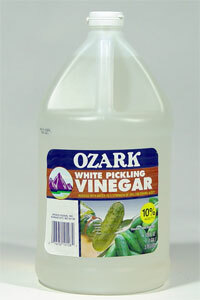 Real vinegar, made from grain alcohol, in 10% or 100 grain concentration is the proper vinegar to use for killing weeds. It can be sprayed straight with no water dilution; however, 20% vinegar is the one primarily found in garden centers and hardware stores in the U.S. For a more powerful product, add 1-2 oz. of orange oil and 1 teaspoon of liquid soap per gallon of vinegar. 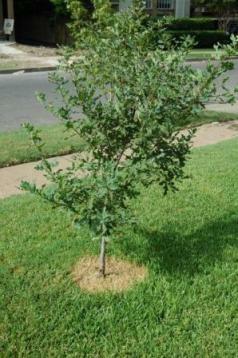 Vinegar is a non-selective herbicide and especially effective on weeds in cracks and in gravel areas. It will kill broadleaf plants and grasses. If the mix is used, keep it shaken during the spraying. The 5% vinegars are for use on food and for helping plants. Use 1 oz. of 5% vinegar per gallon of water when watering potting plants indoors or out. Apple cider vinegar is best because it has more trace minerals and greater fertilizer value. It can also be used at 1 oz. per gallon of water in foliar sprays or in your own Garrett Juice mix. The best apple cider vinegars are those that are organic and contain the "mother" which is the solid looking material in the liquid. Oh yes, I also take at least a tablespoonful myself twice a day. A few drops in your pet’s water or food daily is also a good idea. Here’s more details on the various uses.